Brand new condo built in 2003, 1212 sq ft. Comfortable living space all on 1st floor, so there are no steps to climb. 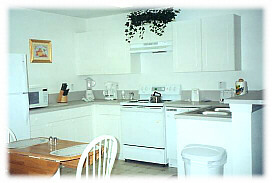 The condo sleeps 8 people with a full size kitchen, full size appliances and also full size washer and dryer. 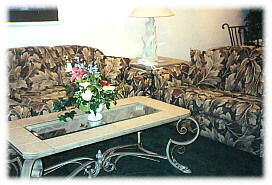 There are 2 full bathrooms and 3 beautiful bedrooms which include a master with a king size bed and a full bath. The other two bedrooms have a queen size bed and two twin beds. The condo has 4 TV'S, all equipped with cable. A 19 " TV in each bedroom and a 25" TV in the livinig room. The condo has a very large heated swimming pool, jacuzzi and tennis court, just a very short walk, aprox 150 FT. Our condo has all the conviences of home and more. 5 Miles From Disney's Front Gates. There are ceiling fans in the master bedroom and living room. Other Information about the bath facilities: 2 tubs with showers in them. Outside parking next to unit - no garage. 2 - phones - one with digital answering machine. There are many activities close by because we are located 5 miles from Disney's front gates and also close to Sea World, Universal Studios, Wet & Wild, Water Parks and the Ocean is approximately 1 hour away so there is plenty to do.